The Charlottesville Police Department and Animal Control ( March 11, 2016) are continuing to look for a wild fox seen behaving aggressively earlier this week in the area of First Street N, W. High Street and Harris Street. CPD has received additional reports of sightings of the fox, but no additional reports of any attacks. Should anyone see a fox or any other animal acting suspiciously, they are asked to get to a safe location and contact CPD so the animal can be checked on. If this is an emergency situation or you have the animal in direct sight please use 911 to report the incident. If you are calling for informational purposes, please use the non-emergency number at the Emergency Communications Center (434-977-9041). Do not approach or attempt to capture the fox yourself. The city council is looking for three citizens to serve on a Code Audit and Streets That Work advisory committee. Applications will be accepted by the City Clerk until November 21st. If you are interested in offering comments about the Streets That Work plan (what makes a street work well? what leads to a street not working so well? what do you think would improve your commute? ), please consider attending a project meeting with staff at the Neighborhood Development Services conference room in City Hall on December 2, 2014 between 5-6:30 pm. The Thomas Jefferson Memorial Unitarian Universalist will host the Eyes Wide Open Exhibit sponsored by the Charlottesville Center for Peace and Justice on Sunday, November 9, 2014. The exhibit has been created by the American Friends Service Committee and is a powerful and silent display of the costs of war. Members of the church have volunteered to supervise the exhibit and to talk with those who come to see it, but there will be members of the Charlottesville Center for Peace and Justice present as well. The city is hosting Town Hall meetings during the upcoming months. The Venable neighborhood will meet in conjunction with the JPA and Lewis Mountain neighborhoods on Thursday, May 14, 2015. The city will share details about the time and location of the meeting as we get closer to the date. Mark your calendars! Starting July 1, 2014, residents on City-maintained streets can begin using the recently distributed wheeled recycling carts. The bi-weekly initiative kicks off this week with collection in Zone A neighborhoods, and Zone B neighborhoods the following week. Recycling days will continue to coincide with the current trash collection days. Standing by the Green City vision, even if residents choose not to participate in the new recycling program, refuse collected by the City’s low-cost trash program will be sorted for recyclable items. However, the City is grateful for customers’ continued diligence in separating recyclables from trash. Since single-stream recycling requires that recyclables are not contaminated by food and garbage, separation prior to collection ensures a higher ratio of recycled materials to landfill waste. For more information, please visit the EPA resources linked on the website. City residents will now be able to recycle most types of plastics, #1-#7 as well as paper, glass, and aluminum products. Exceptions to acceptable items include plastic bags and small caps and lids. These items tend to create litter on the streets and interfere with the machines in the processing facility. Questions about recyclable items can be directed to County Waste at 434-296-6000. Residents are encouraged to try the 95-gallon cart for a few weeks before requesting a smaller size. Those who wish to opt out of the standard size may do so by phone or website. If residents have physical limitations, the red and green 18-gallon City bins may be used during the transition period, until adjustments are made. Thank you for recycling! Stay updated about recycling and other public works programs by following @CvillePW on Twitter. Charlottesville's Board of Architectural Review recommended that City Council should designate a portion of the Rugby Road corridor as a Historic Conservation District based on an application prepared by the Venable Neighborhood Association. The next event in this potential rezoning process will be a joint public hearing with the Planning Commission and City Council that will take place on Tuesday July 8, 2014 at City Hall. City Council will then hold two readings at separate meetings, probably in August. The first phase of the planning process will kick-off on May 27th with a 4 day street design workshop that will establish a vision to better accommodate and prioritize the multiple users of Charlottesville’s streets and we hope you will be able to share your insight throughout the process. The public is invited to attend a kickoff meeting on Tuesday, May 27th at 5:30 pm to learn about the process and hear a presentation from Ian Lockwood on the topic of Livable Streets. Drop in times are scheduled on Thursday, May 29th from 11:00 am -1:00 pm and from 6:30 pm to 8:00 pm for public to review progress. Revised drawings based on public input will be available for review and comment on May 30th at a final presentation from 4:30-5:30 pm at City Space. Every week, the city's various boards, commissions, and advisory groups meet to discuss matters that affect our community. These meetings are open to the public and you are encouraged to participate in them or just listen in. For example, the May meeting of the Board of Architectural Review includes on its agenda a discussion of a proposed Historic Conservation District rezoning for a small section of the Venable neighborhood. Please check the City of Charlottesville webpage at http://www.charlottesville.org/ to see the "Community" link that provides current information on public meetings through the City Meetings and Events Calendar. And don't hesitate to contact your Venable Neighborhood Association board if you have any questions. at the City Council Chambers. Informational meeting hosted by the Sigma Chi fraternity located on Preston Place - will be held on Tuesday, March 4th, 2014 from 6:30-8:00PM at Thomas Jefferson Memorial Church located at 717 Rugby Road. The meeting is intended to provide the neighborhood with information about Sigma Chi's plans to renovate and improve their Chapter House. The meeting is an open-house style format, so neighbors ahould feel free to stop by whenever it is convenient for them during that time. Sigma Chi will provide light refreshments and have several representatives of the Chapter on hand to discuss their plans and answer questions. If anyone has questions, please feel free to contact Michael S. Kreamer, President, PSI Chapter msk7fv@virginia.edu or Michael Guthrie, Board of Directors, House Corporation, PSI Chapter Chaptermichael@mrg7175.com. You are invited to participate in the City's West Main project! The project team is eager to receive citizen input on this important initiative that touches our neighborhood. Mark your calendars for some exciting events this week. Many of you have been following the progress of a proposed development in the Venable neighborhood called Meadowbrook Flats. This proposed development plans for new buildings and parking within the Meadowbrook Shopping Center. Many of you have been concerned about the negative impacts to our neighborhood of additional traffic and poorly designed buildings and landscapes that may accompany this development. Also, the Planning Commission will review this project next week on Tuesday the 14th in Council Chambers, City Hall. Members of the public will be allowed to sign up for a speaking slot starting at 5:30pm. We encourage everyone to attend and let the commission know how you feel about the project. Even if you do not wish to speak, your presence makes a difference! The proposed Meadowbrook Flats residential development at Barracks Road and Emmet Street is still alive. The plans have evolved slightly since the spring. The informal group of neighbors (from the Meadowbrook Hills/Rugby area and from Venable) that has been monitoring the project still believes that it has basic flaws that will hurt our immediate area, our house values, traffic flow, and the larger city. This message outlines our concerns and it provides you with some information about how you can register your own views as the City reviews this plan. The Meadowbrook Flats development (aka 1138 Emmet Street) will be on the agenda of the Charlottesville City Planning Commission, Tuesday, September 10. Much of the project is “by right,” but the Planning Commission must consider two specific issues: does the project comply with the Entrance Corridor Guidelines, and should it receive a waiver from the Critical Slope Ordinance? We encourage you to attend the meeting. You can also offer your views in e mail to the Planning Commission, to City Council, or to the Neighborhood Planner in charge of reviewing this project (Brian Haluska). Contact information for all these folks appears at the end of this message. Please write those city personnel with your views. Public Comments will make a big difference. The Coordinating Committee tracking the Meadowbrook Flats project has developed some talking points that residents can reference when speaking or writing about their concerns. It is recommended that not all of the points be included in each communication. Each resident should express in his/her own words those points which they find most important. • Height : The structure does not adhere to the Entry Corridor Guidelines adopted by the City which recommends that buildings along the corridor be no more than three stories tall. The building overwhelms not only the site itself, but also the adjacent properties and neighborhoods. • Traffic: The traffic consequences are significant as the traffic will clearly flow into Barracks Road, backing traffic up as it heads up the hill, forcing drivers to seek alternate routes through the adjacent neighborhoods. The intersections of Barracks and Rugby, as well as Barracks and Emmet, are already congested, which is not only inconvenient, but dangerous as it will impact emergency vehicles. • Project Design: The project is poorly designed regarding landscaping, resident amenities and pedestrian and bicycle access. The project does not incorporate any green space, picnic tables, or play areas for kids. Residents will have to leave the property in order to engage in daily activities. The corner of Barracks Road and Emmet is already unsafe for pedestrians to cross over Barracks Road from Meadowbrook Road. • Negative Impact on Neighboring Businesses: If the congestion continues to worsen, shoppers will avoid Meadowbrook Shopping Center, and surrounding businesses (Barracks Road Shopping Center) because the congestion will be too difficult to handle, impacting not only businesses, but City revenues as the traffic congestion will encourage shoppers to go outside the city limits to make purchases. • Piecemeal Design: The City should not grant waivers for this portion of the site, while the rest of it remains underdeveloped and badly designed. A thoughtful design for the entire site would be much better, one compliant with the entrance corridor guidelines. Piecemeal design for that key corner in the City will give the worst possible outcome. • Intensive Development: There are already far too many projects in place and/or in the planning stages. This intensive development does not serve the City, neighborhoods or businesses. There is too much happening and not much coordination for the common good. • Parking: The developer is planning 73 two-bedroom units. If the city only requires one parking space per unit, but the units are two bedrooms each, this makes it very possible that there will be two cars for each unit (plus guest parking). Where is everyone else going to park? Will the excess overflow onto Meadowbrook Road or into the Venable Neighborhood? • Construction Disruption: During the years-long process of development and construction, the disruption to both traffic and to the Meadowcreek stream, which is right across the street and downhill from the development, could be significant. • Property Values & Taxes: The adjacent neighborhoods have always had the highest, and most stable, property values in the City limits. This development would cause property values, and in turn, personal property tax revenues to decline. Please act now to register your view. This is our city and we need to speak out. You can send your concerns to Brian Haluska, City Planner at haluska@charlottesville.org (434) 970-3186 or to: Charlottesville City Planning Commission. NOTE: To contact these individuals please call the Department of Neighborhood Development Services at (434) 970-3182. To reach any member of the City Council, you can send an e-mail to the Clerk of Council, at council@charlottesville.org. or mail a letter to P.O. Box 911, City Hall, Charlottesville, VA, 22902, or call (434) 970-3113. You may also contact the individual City Council members directly (See below). In May, Pinnacle Construction filed plans with the city for a two-phase development in the area currently occupied by the Meadowbrook Shopping Center - near the corner of Barracks Road and Emmet Streets. After objections raised by city planners, staff, and neighbors, the Phase 2 plan was withdrawn. The apartment building of Phase 1 (72 apartments) remains under review with the city planning department. It is unclear at this date as to exactly when the planning commission will review the plans for Meadowbrook Flats. However, this will be a key moment for public input. 3) the memo of March 29 by the Zoning Administrator was not a formal interpretation of the City Code, but rather an internal departmental communication. The result is that we have withdrawn our appeal to the Board of Zoning Appeals (BZA), which was scheduled to be heard on July 18. The Zoning Administrator will now continue his investigation of whether the current lot is a conforming use or not, and we have reserved our right to appeal whatever final determination he makes on this issue. 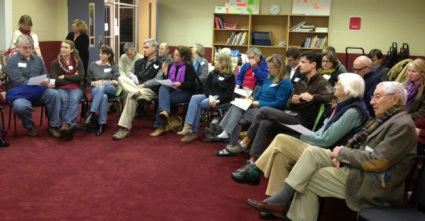 Neighbors gathered on Tuesday, October 30, 2012 at the Hope Community Center.